Moody Nolan had a vision for the design of a one-of-a-kind student recreation complex for the West Virginia University campus. The vision became a reality, and today, the campus features an award-winning recreation center designed with innovative form and state-of-the-art amenities for the entire school and community. The modern 177,000 sq. 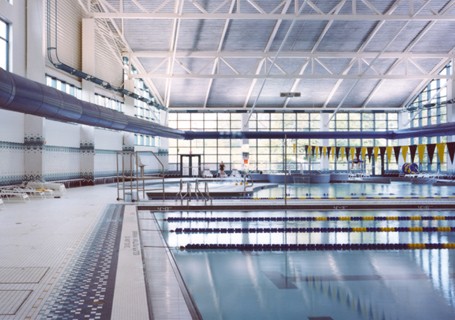 ft. facility includes weight/fitness equipment; courts for basketball, volleyball, badminton, squash, and racquetball; six lane fitness and leisure pools; an elevated jogging track; a whirlpool that seats 20; and an outdoor recreation center with renting options for ski, camping, and other equipment. The focal point of the facility is a 50 ft. indoor climbing wall, featuring more than 1,000 interchangeable hand-holds attached to 3,500 sq. ft. of simulated rock surface. Beginners and climbers of all skill levels can challenge themselves, hone their skills, and keep in shape. The facility has been featured in several magazines and has won nine industry design awards.